As I begin my term as Australia’s High Commissioner to Sri Lanka, I see tremendous potential in the bilateral economic relationship. Our two-way trade is moving closer to the magical A$ 1 billion mark. Investment prospects are growing. Bilateral trade tends to reflect our traditional exports: Australia’s focused on agribusiness such as lentils, dairy and paper; and Sri Lanka’s dominated by tea, textiles and rubber products. On the services side, the education story is truly remarkable – over 6000 Sri Lankan students are currently studying in Australia. Our two-way tourism relationship continues to grow strongly with more than 60,000 Australians visiting Sri Lanka each year. These are all important trades. And there is potential for further growth in all of them. But looking over the horizon, let’s ask ourselves what the trade profile might look like in 20 years. Could Australian expertise in environmentally sustainable mining be shared with Sri Lanka? 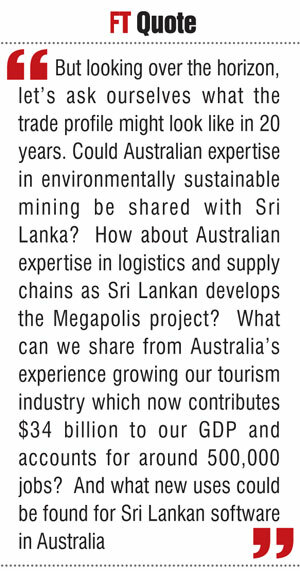 How about Australian expertise in logistics and supply chains as Sri Lankan develops the Megapolis project? What can we share from Australia’s experience growing our tourism industry which now contributes $34 billion to our GDP and accounts for around 500,000 jobs? And what new uses could be found for Sri Lankan software in Australia. These are the conversations I look forward to having with Sri Lanka’s business community. I know there are plenty of businesses here working at the cutting edge of global markets in software, manufacturing and other fields, and searching out opportunities in global value chains. You’ll always find an open door at the High Commission to discuss your business. 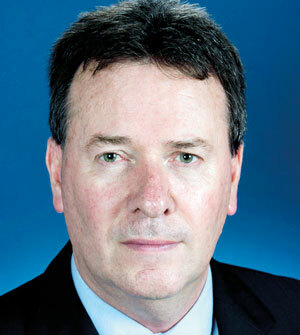 I’ll be encouraging Australian business to look at new investment opportunities in Sri Lanka. The proximity to India and other important markets is a drawcard, and the improving Sri Lankan business environment supports greater investment. I’m a strong supporter of those in Sri Lanka who seek a more open economy. To be a regional hub of economic activity, Sri Lanka needs to be both an exporter and an importer. And that means some hard decisions need to be taken on tariff and other barriers to imports. Australia went through a sustained economic reform period in the 1980s and 1990s taking us from a relatively closed economy to one of the most open economies globally. It did our economy a world of good – since then we’ve enjoyed 24 years of uninterrupted economic growth. Reform is always tough, but we have found it to be worth it. We learnt along the way the critical importance of building a broad coalition in favour of reform. Business, civil society and government need to work together to design, sell and implement reform. On a more parochial front, it won’t surprise you to hear that we’d like to see a reduction in the tariff and tax applied to Australian wine and fine foods – tourists and domestic consumers should have access to higher quality products at better prices. We think this would support Sri Lanka’s goal of becoming a high-end tourist market. Australia and Sri Lanka’s interests are converging. We share an abiding interest in the stability and prosperity of the Indian Ocean region. We’re both trading nations with a big stake in the openness of global markets and the smooth passage of goods around the world. And we both see value in building regional arrangements that foster a culture of cooperation. And of course we share an interest in the regulation of global migration. I’ll be looking to build on these converging interests – one Indian Ocean state to another. Our economic relationship carries within it so many interesting stories. From the barramundi fingerlings that travel from Australia to Sri Lanka for rearing. Or the Sri Lankan coconut water that refreshes the health conscious joggers at Bondi Beach. The fact that 70% of Australia’s lentils are exported to Sri Lanka – and a few of them return to Australia once processed. Last week I was briefed on innovative Australian technology being used to add value in the Sri Lankan tea industry. I’ll be looking to uncover more of these great stories over the coming years. It’s an exciting time to be in Sri Lanka. And because it’s 2016, you’ll be able to follow me and the High Commission on twitter (@AusHCSriLanka) and Facebook.